As a tech savvy host, you may have been considering moving from traditional locks to smart locks but just haven’t quite pulled the trigger. Maybe it’s the security concerns of smart locks being easily hacked or the sometimes clunky apps your guests are forced to download and learn to use. But if you’re ready to say goodbye to key exchanges, lost keys, or worrying whether a devious prior guest might have made copies, there’s no better time to consider the upgrade to a smart lock with the introduction of the Lockly by PIN Genie, a standout star in a sea of 3rd generation smart locks. 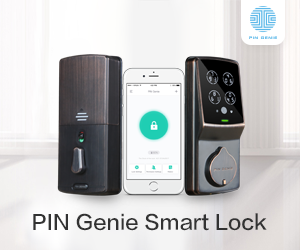 Let’s take a look at what the latest in smart lock technology in Lockly by PIN Genie has to offer to make your life as an Airbnb host more efficient and enjoyable. Besides checking all the marks that third generation smart locks have, here are some features that make it an especially good option for Airbnb hosts. Unlike some of the fussier smart locks out in the market, the Lockly by PIN Genie can be easily installed on practically any door in less than 10 minutes on practically any previous deadbolt lock. And it works for doors that swing left or right. The Lockly by PIN Genie lock comes with all the components you need, nicely packaged with an easy to follow the instructional manual. All you need is a screw driver! VIP Card (IMPORTANT!) – this is a unique ID for your lock so you want to keep this very safe. Lockly by PIN Genie has developed by iOS (PIN Genie Vault) and Android (Pin Genie Applock) apps where you can store your code safely. But I would recommend you keep the physical copy somewhere safe as well. Let’s get straight to the juicy feature that makes the Lockly by PIN Genie so great. It does the job that a lock is designed for, which is to secure a location, far better than most other smart locks. So what makes it more secure? Global Patented PIN pad – unlike existing keypads, the Lockly by PIN Genie pad RANDOMLY distributes the 10 numbers (0-9) into four buttons, each with its own set of 3 numbers that is RESHUFFLED after EACH use. You could literally punch the pin in with a robber looking over your shoulders and not have to worry. Uses Bluetooth instead of WIFI – again, unlike most smart locks that use the easily hackable and less secure home Wi-Fi network, Lockly by PIN Genie uses a guests phone to communicate with the lock via bluetooth instead of directly sending the e-key. Meaning? You can send an access code to your guest they will receive only when they’re at the front door to receive the e-key. And all communications using their apps are encrypted using military grade AES 256 bit encryption. Super safe. Built in 95dB siren alarm – alarm is triggered when someone tries to break in. Loud enough for neighbors to hear. If you are friendly with your neighbors, then they would know to call for help for you. Safe mode auto disable – after three unsuccessful attempts, the touchscreen will go into safe mode and require the right password entered twice to re-enable. When you’re home, you can easily turn on Security mode which will disable the pin pad, something not available in most other smart locks. The PIN Genie apps (both iOS and Android) are carefully designed for easy use by both hosts and guests. First, as the homeowner, you will set up your new lock using the Master Mode. Then you can add family members through Family Mode. Lastly, for your guests, you will be controlling access through the Visitor Mode. For whom is the Lockly by PIN Genie great for? Price: Smart locks are pricier than regular locks and theLockly by PIN Genie is priced comparably to other big names in smart locks. Expect to spend $240-$300 depending on the model. Remote hosting: If you’re living on your property that you’re renting and are mostly available to your guests, you may not benefit as much as a remote host. Traffic: if you’re getting just a handful of bookings a month and you’re local, it may not be worth the upgrade. But if you’re booked solid and are frequently doing key exchanges, this is a far more secure and convenient solution than traditional key & locks. If you’re ready to give the latest and greatest tech in smart locks a try, you can find Lockly by PIN Genie by clicking the link below.